Perhaps you've seen the commercials advising us to save money by purchasing our animal's medicines online, and they're actually speaking the truth. While we might expect our veterinarian to mark up the prices of their prescription products slightly to help them absorb the costs of storage, dispensing, sales tax, and shipping & handling, it might be a lot more than you would think, up to 275% in some cases. While the markup for common medications like heartworm prevention, flea and tick remedies are usually around 100% in most cases, that’s still pretty steep. Purchasing these prescriptions online can save a bundle. Yearly trips to the veterinarian will save money in the long run, especially when it comes to preventative care. Humans can help their animals by keeping a good eye (and hand) on them during the rest of the year. One health care measure some pet owners overlook is dental hygiene and our animals can contract the same issues as humans including periodontitis, gingivitis, gum disease and tooth decay. Contracted or left untreated, these conditions can require the use of sedation or anesthesia for a complete dental examination and treatment, both of which are very expensive. To avoid these costs, brush your dog's (or cat's) teeth daily. Instead of buying them a new toy or other present, opt for a good brush and some toothpaste instead. Byproducts: Labeled as beef, fish and poultry, these meat leftovers can be almost anything including diseased tissues, organs and tumors. Poisons: Propylene Glycol, an ingredient found in antifreeze, and Ethoxyquin, used as an herbicide, are both toxic for animals. BHT/BHA Butylated-hydroxyanisole (BHA) or butylated hydroxytoluene (BHT), both used as a preservative, are linked to kidney damage and cancer. Corn or corn syrup: Too much of this grain and its sweetener can cause a variety of issues including diabetes and allergic reactions in some animals. Another danger from grains comes from mycotoxins, molds that can grow unnoticed, that can remain undetected and wind up in our pet's food. These toxins have been linked to diseases and deaths in some animals. As the old saying goes, sometimes you have to spend money to make money. So when it comes to caring and feeding our four-legged friends, spending a little bit more upfront can save big bucks on vet bills later on. 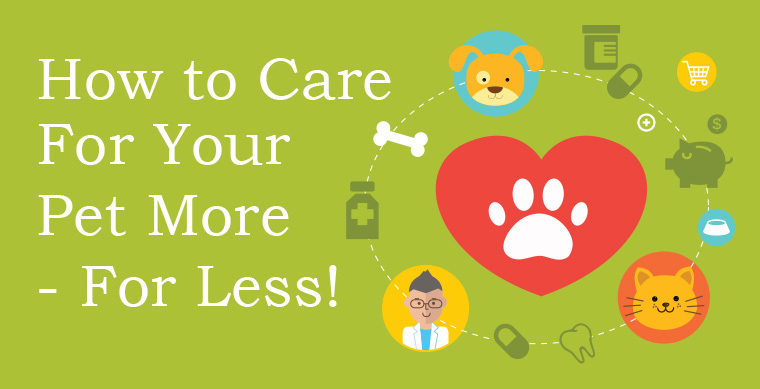 We hope you find these tips helpful when it comes to saving money on your pet's health care. For more great tips on providing pet care on a budget and the latest deals in pet supplies, like us on Facebook and subscribe to our weekly newsletter!